Only two months after a nationwide crackdown on fake infant formula, one baby died and 20 were hospitalized with severe malnutrition in eastern China after drinking low-quality milk powder, a state newspaper said Wednesday. The infants in Suqian, a city northwest of Shanghai, suffered from swelling and anemia, both symptoms of severe malnutrition, the Legal Daily newspaper said. Two twins were so swollen that their eyes were sunken and doctors were unable to draw blood from their limbs, said the newspaper that is published by China's Justice Ministry. In early May, Chinese Premier Wen Jiabao ordered a crackdown on safety violations in China's food and drug markets, where phony medicines and other products regularly cause deaths and injuries. State media, which first publicized the cases in April, reported then that 50 to 60 children, mostly from poor farm families, died of malnutrition in the city of Fuyang after being fed a bogus milk formula, which contained only tiny amounts of nutrients. On Wednesday in Fuyang, Mayor Liu Qingqiang was reprimanded by the ruling Communist Party for failing to supervise food safety, while Vice Mayor Ma Mingyue was asked to resign, state media reported. In the continuing crackdown, authorities have banned 55 brands of cheap milk powder after they were found to contain only tiny fractions of the required amounts of protein and other nutrients. Inspectors in Suqian found two brands on sale that contained as little as 1.5 percent nutrients, Legal Daily said. The national standard is 12 percent to 20 percent. Investigators say the inferior milk powder is mostly starch, flour and sugar. The powders' containers listed fake addresses and phone numbers for manufacturers, the newspaper said. It said authorities were trying to trace them through shops that sold the products. 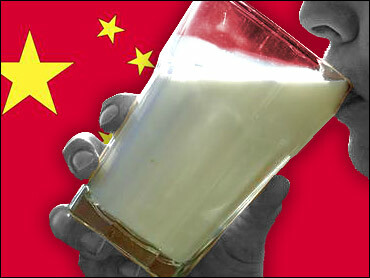 The victims of low-quality foods and medicine sold in China are often the country's poorest people. Many parents of malnourished children were too poor to take them to hospitals. They died and were buried at home. Two officials have been arrested for covering up the malnutrition death of a baby girl in Anhui. At least 229 infants there suffered from malnutrition after drinking low-quality formula.